Researchers at Lawrence Livermore National Laboratory discovered interesting ways to advance the capabilities of two-photon lithography, a high-resolution 3D printing technique capable of producing nanoscale features which unleashes the potential for X-ray computed tomography to analyze stress or defects noninvasively in embedded in 3D printed medical devices or implants. Two-photon lithography stereotypically requires a thin glass slide, a lens and an immersion oil to help the laser light focus to a fine point where curing and printing occurs. 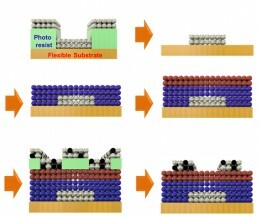 The findings were published in the journal of ACS Applied Material and Interfaces. In the paper, researchers describe cracking the code on resist materials improved for two-photon lithography and forming 3-D microstructures with features less than 150 nanometer which is better in comparison to previous techniques which build structures from ground up, limiting the height of the objects. According to LLNL researcher James Oakdale, “In this paper, we have unlocked the secrets to making custom materials on two-photon lithography systems without losing resolution”, because the laser light refracts as it passes through the photoresist material, the cornerstone is discovering how to match the refractive index of the resist material to the immersion medium of the lens so the laser could pass through unimpeded. Investigators can now use X-ray computed tomography as an analytical tool to copy the inside parts without cutting them open and to investigate 3D printed objects by fine-tuning the material’s x-ray absorption. The only limiting factor is the time it takes to build, so the researchers are investigating how to speed up the process. These techniques could be used to harvest and probe the internal structure of targets for the National Ignition Facility, as well as optical and mechanical metamaterials and 3D-printed electrochemical batteries. NIH has awarded $15 million for Tissue Chip for Disease Modeling and Efficacy Testing to develop 3D human tissue models. The 3D platforms, also called tissue chips support living cells and human tissues, it mimics the complex biological functions of organs/tissues and at the same time provide a new way to test potential drugs and their effectiveness. The awards will allow scientists to study and understand diseases mechanism and forecast how patients respond and is part of the first phase of a five-year program. According to NCATS Director, Dr. Christopher P. Austin “these tissue chips to provide more accurate platforms to understand diseases, and to be more predictive of the human response to drugs than current research models, thereby improving the success rate of candidate drugs in human clinical trials”. The awards will be used to study common and rare diseases including rheumatoid arthritis, influenza A, kidney disease, amyotrophic lateral sclerosis, or ALS, arrhythmogenic cardiomyopathy, and hemorrhagic telangiectasia. Award recipients are Brigham and Women’s Hospital, Cedars-Sinai Medical Center, Columbia University, Duke University, Harvard University, Northwestern University, University of California Davis, University of California Irvine, University of Pittsburgh, University of Rochester, University of Washington Seattle and Vanderbilt University. The 3D printer we think more frequently in combination with PCBs is the DragonFly 2020 from Nano Dimension which works with different with all kinds of materials in addition to PCBs as they are a great 3D printing player in electronic space. The Ultrasound Research group at Neurotechnology (http://www.neurotechnology.com) has proclaimed a new 3D printing method using ultrasonic manipulation which are totally hands off and non-contact tech behind it, permitting for the handling of parts and particles down to submillimeter range without causing damage to sensitive components. According to the project lead for Neurotechnology Ultrasound Research Group, Dr. Osvaldas Putkis, “Ultrasonic manipulation can handle a very large range of different materials, including metals, plastics and even liquids. Not only can it manipulate material particles, it can also handle components of various shapes. Other non-contact methods, like the ones based on magnetic or electrostatic forces, can’t offer such versatility”. Since the work from the Ultrasound Research Group embodies a new technological application, Neurotechnology has filed a patent on their system. Neurotechnology describes ultrasonic manipulation as a “non-contact material handling method which uses ultrasonic waves to trap and move small particles and components.” It is well known that ultrasonic manipulation of particles exploits the acoustic radiation force to deliver a contactless handling method for particles suspended in a fluid. In an ultrasonic standing wave field, the viscous torque induces the rotation of an object. Alongside the translation of particles due to the acoustic radiation force an additional controlled degree of rotation is obtainable. Consequently, there is a growing interest in spreading the field of application of ultrasonic particle manipulation to the deposition of micro and nanowires and for the assembly of micro objects. Ultrasonic transducers are arranged in an array used to position electronic components in the creation of a PCB, utilizing a camera to detect accurate positioning. Continuing on with the hands-off theme, a laser solders the PCB components after their non-contact manipulation into placement. 3D printing and PCB manufacture are increasingly coming together, as advanced technologies benefit the creation of devices in electronics, including via 3D printed workstations for PCBs. Even though their method works with all types of materials, we expect to see further applications beyond PCB assembly. It would be a stretch to say that Joe Vinciquerra is the Julia Child of GE. But Vinciquerra, the manager of the newly formed Additive Materials Lab at GE Global Research, is creating a cookbook that will likely impact manufacturing across GE the same way “Mastering the Art of French Cooking” shook up American kitchens. Additive manufacturing, commonly known as 3D printing, is exploding right now. GE estimates that by 2025, more than 20 percent of new products will involve additive processes of some kind. But there’s no cookbook that standardizes the recipes, which have oodles of parameters that determine the properties of the final part. Technologies like direct metal laser melting (DMLM), for example, can involve several lasers as powerful as 1 kilowatt—enough to burn a hole in a wall—fusing as many as 1,250 layers of fine superalloy powder into the desired shape. Some large builds can take days to finish. Last week, GE opened a new industrial-scale 3D-printing center in Pittsburgh, Pennsylvania. It will work closely with Vinciquerra’s team, test their findings and get GE factories quickly cooking with additive. The team is pulling in expertise from other labs on the GE Global Research campus in Niskayuna, New York, including scientists focusing on nanomaterials, microstructures and machine design. The company calls the cross-pollination of know-how the GE Store. GE materials scientists are no strangers to new materials. They spent two decades developing light- and heat-resistant materials called ceramic matrix composites that outperform even the most advanced superalloys and make jet engines and gas turbines lighter and more efficient. But additive materials live in a different universe. “With additive, you can design as you go and create architectures that cannot be manufactured by any other means,” Vinciquerra says. He says that GE engineers can already design components with sophisticated, performance-enhancing features previously unattainable by any other means of manufacturing. The next-generation LEAP jet engine—developed by CFM International, a joint venture between GE Aviation and France’s Snecma (Safran)—uses 3D-printed fuel nozzles, which are 25 percent lighter and five times more durable. They used to be made from 18 separate parts and now they come in one piece. A year ago, the Federal Aviation Administration (FAA) approved a fist-sized housing for a sensor as the first 3D-printed part to fly inside GE commercial jet engines. To read the original story, published on GE Reports, click here! Nanoscale electronic components can be made from single DNA molecules, as researchers at the University of Georgia and at Ben-Gurion University in Israel have demonstrated, using a single molecule of DNA to create the world’s smallest diode. A diode is a component vital to electronic devices that allows current to flow in one direction but prevents its flow in the other direction. 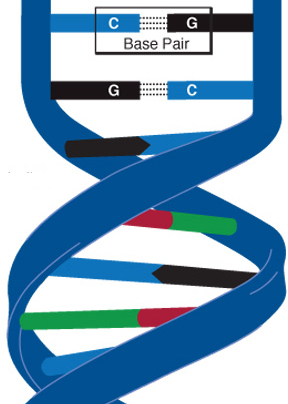 The development could help stimulate development of DNA components for molecular electronics. They found, surprisingly, that this caused the current flowing through the DNA to be 15 times stronger for negative voltages than for positive voltages, a necessary feature of a diode. “Our discovery can lead to progress in the design and construction of nanoscale electronic elements that are at least 1,000 times smaller than current components,” says the study’s lead author, Bingqian Xu an associate professor in the UGA College of Engineering and an adjunct professor in chemistry and physics. 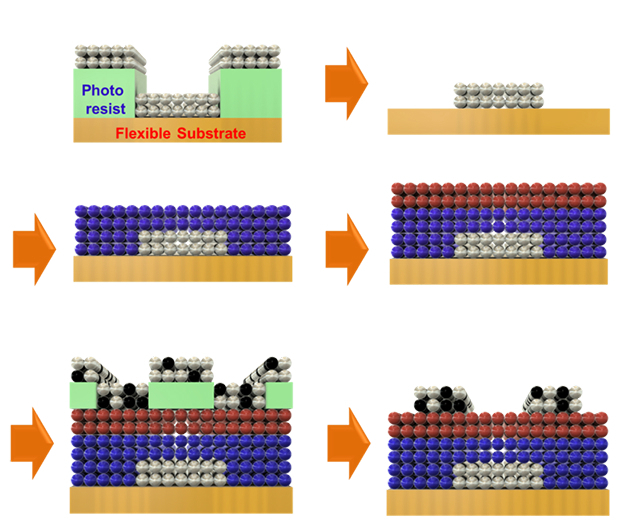 The research team plans to enhance the performance of the molecular diode and construct additional molecular devices, which may include a transistor (similar to a two-layer diode, but with one additional layer). A theoretical model developed by Yanantan Dubi of Ben-Gurion University indicated the diode-like behavior of DNA originates from the bias voltage-induced breaking of spatial symmetry inside the DNA molecule after the coralyne is inserted. *“We prepared the DNA–coralyne complex by specifically intercalating two coralyne molecules into a custom-designed 11-base-pair (bp) DNA molecule (5′-CGCGAAACGCG-3′) containing three mismatched A–A base pairs at the centre,” according to the authors. UPDATE April 6, 2016 to clarify the coralyne intercalation (insertion) into the DNA molecule. 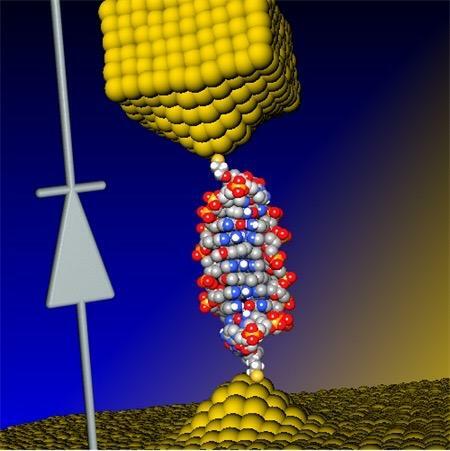 The predictability, diversity and programmability of DNA make it a leading candidate for the design of functional electronic devices that use single molecules, yet its electron transport properties have not been fully elucidated. This is primarily because of a poor understanding of how the structure of DNA determines its electron transport. Here, we demonstrate a DNA-based molecular rectifier constructed by site-specific intercalation of small molecules (coralyne) into a custom-designed 11-base-pair DNA duplex. Measured current–voltage curves of the DNA–coralyne molecular junction show unexpectedly large rectification with a rectification ratio of about 15 at 1.1 V, a counter-intuitive finding considering the seemingly symmetrical molecular structure of the junction. A non-equilibrium Green’s function-based model—parameterized by density functional theory calculations—revealed that the coralyne-induced spatial asymmetry in the electron state distribution caused the observed rectification. This inherent asymmetry leads to changes in the coupling of the molecular HOMO−1 level to the electrodes when an external voltage is applied, resulting in an asymmetric change in transmission. 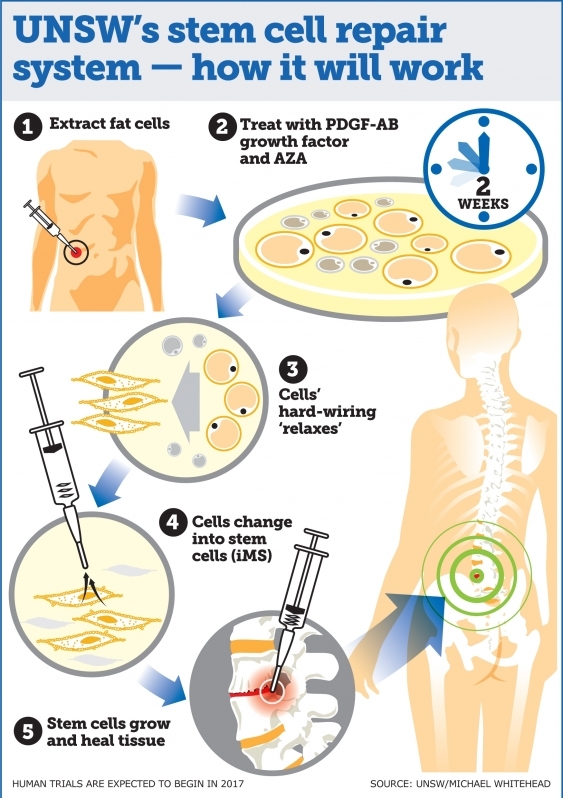 A stem cell therapy system capable of regenerating any human tissue damaged by injury, disease, or aging could be available within a few years, say University of New South Wales (UNSW Australia) researchers. 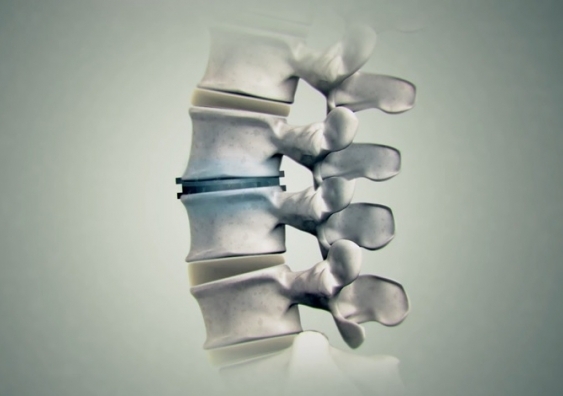 Their new repair system*, similar to the method used by salamanders to regenerate limbs, could be used to repair everything from spinal discs to bone fractures, and could transform current treatment approaches to regenerative medicine. The UNSW-led research was published this week in the Proceedings of the National Academy of Sciences journal. The system reprograms bone and fat cells into induced multipotent stem cells (iMS), which can regenerate multiple tissue types and has been successfully demonstrated in mice, according to study lead author, haematologist, and UNSW Associate Professor John Pimanda. There are different types of stem cells including embryonic stem (ES) cells, which during embryonic development generate every type of cell in the human body, and adult stem cells, which are tissue-specific, but don’t regenerate multiple tissue types. Embryonic stem cells cannot be used to treat damaged tissues because of their tumor forming capacity. The other problem when generating stem cells is the requirement to use viruses to transform cells into stem cells, which is clinically unacceptable, the researchers note. Human trials are planned next year once the safety and effectiveness of the technique using human cells in mice has been demonstrated. * The technique involves extracting adult human fat cells and treating them with the compound 5-Azacytidine (AZA), along with platelet-derived growth factor-AB (PDGF-AB) for about two days. The cells are then treated with the growth factor alone for a further two-three weeks. Current approaches in tissue engineering are geared toward generating tissue-specific stem cells. Given the complexity and heterogeneity of tissues, this approach has its limitations. An alternate approach is to induce terminally differentiated cells to dedifferentiate into multipotent proliferative cells with the capacity to regenerate all components of a damaged tissue, a phenomenon used by salamanders to regenerate limbs. 5-Azacytidine (AZA) is a nucleoside analog that is used to treat preleukemic and leukemic blood disorders. AZA is also known to induce cell plasticity. We hypothesized that AZA-induced cell plasticity occurs via a transient multipotent cell state and that concomitant exposure to a receptive growth factor might result in the expansion of a plastic and proliferative population of cells. To this end, we treated lineage-committed cells with AZA and screened a number of different growth factors with known activity in mesenchyme-derived tissues. Here, we report that transient treatment with AZA in combination with platelet-derived growth factor–AB converts primary somatic cells into tissue-regenerative multipotent stem (iMS) cells. iMS cells possess a distinct transcriptome, are immunosuppressive, and demonstrate long-term self-renewal, serial clonogenicity, and multigerm layer differentiation potential. Importantly, unlike mesenchymal stem cells, iMS cells contribute directly to in vivo tissue regeneration in a context-dependent manner and, unlike embryonic or pluripotent stem cells, do not form teratomas. Taken together, this vector-free method of generating iMS cells from primary terminally differentiated cells has significant scope for application in tissue regeneration. University of Pennsylvania engineers have developed a simplified new approach for making transistors by sequentially depositing their components in the form of liquid nanocrystal “inks.” The new process open the door for transistors and other electronic components to be built into flexible or wearable applications. It also avoids the highly complex current process for creating transistors, which requires high-temperature, high-vacuum equipment. Also, the new lower-temperature process is compatible with a wide array of materials and can be applied to larger areas. The researchers’ nanocrystal-based field effect transistors were patterned onto flexible plastic backings using spin coating, but could eventually be constructed by additive manufacturing systems, like 3D printers. Published in the journal Science, the study was lead by Cherie Kagan, the Stephen J. Angello Professor in the School of Engineering and Applied Science, and Ji-Hyuk Choi, then a member of her lab, now a senior researcher at the Korea Institute of Geoscience and Mineral Resources. Researchers at Korea University Korea’s Yonsei University were also involved. Such a process entails layering or mixing them in precise patterns. 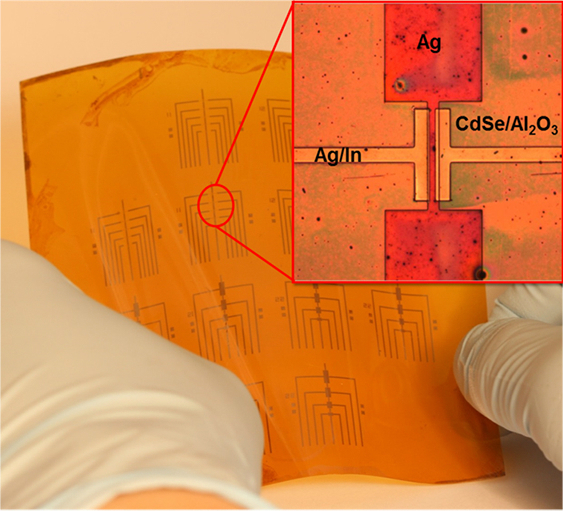 First, the conductive silver nanocrystal ink was deposited from liquid on a flexible plastic surface that was treated with a photolithographic mask, then rapidly spun to draw it out in an even layer. The mask was then removed to leave the silver ink in the shape of the transistor’s gate electrode. 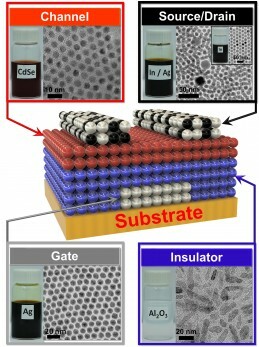 The researchers followed that layer by spin-coating a layer of the aluminum oxide nanocrystal-based insulator, then a layer of the cadmium selenide nanocrystal-based semiconductor and finally another masked layer for the indium/silver mixture, which forms the transistor’s source and drain electrodes. Upon heating at relatively low temperatures, the indium dopant diffused from those electrodes into the semiconductor component. Because this entirely ink-based fabrication process works at lower temperatures than existing vacuum-based methods, the researchers were able to make several transistors on the same flexible plastic backing at the same time. The research was supported by the National Science Foundation, the U.S. Department of Energy, the Office of Naval Research, and the Korea Institute of Geoscience and Mineral Resources funded by the Ministry of Science, ICT, and Future Planning of Korea. Synthetic methods produce libraries of colloidal nanocrystals with tunable physical properties by tailoring the nanocrystal size, shape, and composition. Here, we exploit colloidal nanocrystal diversity and design the materials, interfaces, and processes to construct all-nanocrystal electronic devices using solution-based processes. 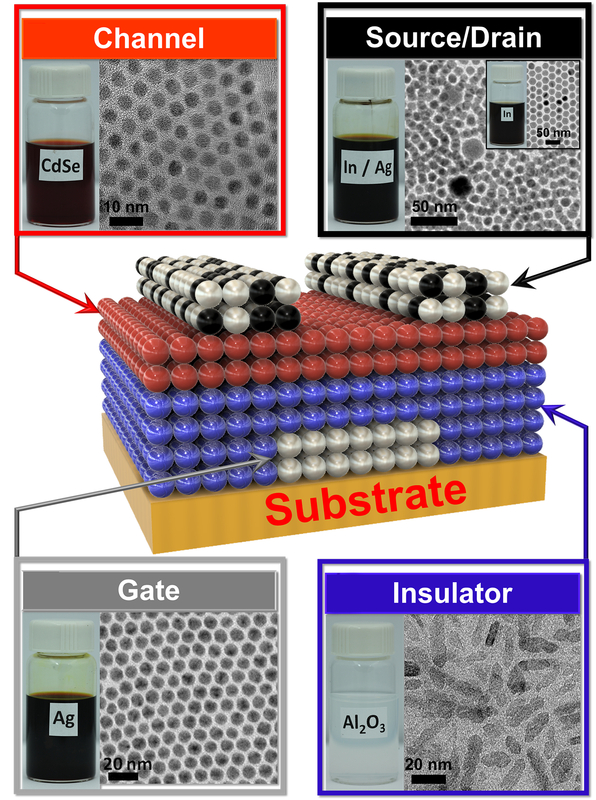 Metallic silver and semiconducting cadmium selenide nanocrystals are deposited to form high-conductivity and high-mobility thin-film electrodes and channel layers of field-effect transistors. Insulating aluminum oxide nanocrystals are assembled layer by layer with polyelectrolytes to form high–dielectric constant gate insulator layers for low-voltage device operation. Metallic indium nanocrystals are codispersed with silver nanocrystals to integrate an indium supply in the deposited electrodes that serves to passivate and dope the cadmium selenide nanocrystal channel layer. We fabricate all-nanocrystal field-effect transistors on flexible plastics with electron mobilities of 21.7 square centimeters per volt-second. Elizabeth Loboa, dean of the Missouri University College of Engineering, and her team have tested new tissue- engineering methods (based on textile manufacturing) to find ones that are most cost-effective and can be produced in larger quantities. Tissue engineering is a process that uses novel biomaterials seeded with stem cells to grow and replace missing tissues. When certain types of materials are used, the “scaffolds” that are created to hold stem cells eventually degrade, leaving natural tissue in its place. The new tissues could help patients suffering from wounds caused by diabetes and circulation disorders, patients in need of cartilage or bone repair, and women who have had mastectomies by replacing their breast tissue. The challenge is creating enough of the material on a scale that clinicians need to treat patients. 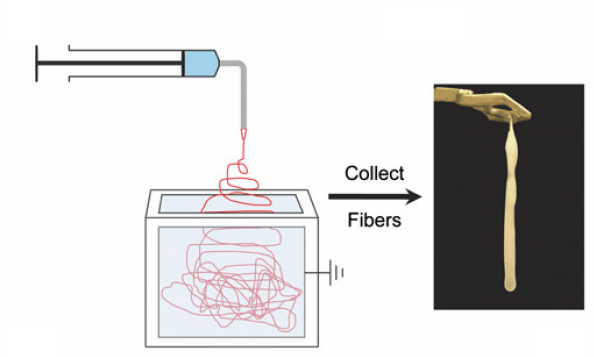 In typical tissue engineering approaches that use fibers as scaffolds, non-woven materials are often bonded together using an electrostatic field. This process, called electrospinning (see Nanoscale scaffolds and stem cells show promise in cartilage repair and Improved artificial blood vessels), creates the scaffolds needed to attach to stem cells. The group published two papers using three industry-standard, high-throughput manufacturing techniques — meltblowing, spunbonding, and carding — to determine if they would create the materials needed to mimic native tissue. Meltblowing is a technique during which nonwoven materials are created using a molten polymer to create continuous fibers. Spunbond materials are made much the same way but the fibers are drawn into a web while in a solid state instead of a molten one. Carding involves the separation of fibers through the use of rollers, forming the web needed to hold stem cells in place. Loboa and her colleagues tested these techniques to create polylactic acid (PLA) scaffolds (a Food and Drug Administration-approved material used as collagen fillers), seeded with human stem cells. They then spent three weeks studying whether the stem cells remained healthy and if they began to differentiate into fat and bone pathways, which is the goal of using stem cells in a clinical setting when new bone and/or new fat tissue is needed at a defect site. Results showed that the three textile manufacturing methods proved as viable if not more so than electrospinning. Researchers at North Carolina State University and the University of North Carolina at Chapel Hill were also involved in the two studies, which were published in Biomedical Materials (open access) and Acta Biomaterialia. The National Science Foundation, the National Institutes of Health, and the Nonwovens Institute provided funding for the studies. Electrospun nonwovens have been used extensively for tissue engineering applications due to their inherent similarities with respect to fibre size and morphology to that of native extracellular matrix (ECM). However, fabrication of large scaffold constructs is time consuming, may require harsh organic solvents, and often results in mechanical properties inferior to the tissue being treated. In order to translate nonwoven based tissue engineering scaffold strategies to clinical use, a high throughput, repeatable, scalable, and economic manufacturing process is needed. We suggest that nonwoven industry standard high throughput manufacturing techniques (meltblowing, spunbond, and carding) can meet this need. 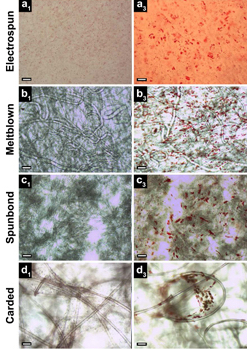 In this study, meltblown, spunbond and carded poly(lactic acid) (PLA) nonwovens were evaluated as tissue engineering scaffolds using human adipose derived stem cells (hASC) and compared to electrospun nonwovens. Scaffolds were seeded with hASC and viability, proliferation, and differentiation were evaluated over the course of 3 weeks. We found that nonwovens manufactured via these industry standard, commercially relevant manufacturing techniques were capable of supporting hASC attachment, proliferation, and both adipogenic and osteogenic differentiation of hASC, making them promising candidates for commercialization and translation of nonwoven scaffold based tissue engineering strategies. The fabrication and characterization of novel high surface area hollow gilled fiber tissue engineering scaffolds via industrially relevant, scalable, repeatable, high speed, and economical nonwoven carding technology is described. Scaffolds were validated as tissue engineering scaffolds using human adipose derived stem cells (hASC) exposed to pulsatile fluid flow (PFF). The effects of fiber morphology on the proliferation and viability of hASC, as well as effects of varied magnitudes of shear stress applied via PFF on the expression of the early osteogenic gene marker runt related transcription factor 2 (RUNX2) were evaluated. Gilled fiber scaffolds led to a significant increase in proliferation of hASC after seven days in static culture, and exhibited fewer dead cells compared to pure PLA round fiber controls. Further, hASC-seeded scaffolds exposed to 3 and 6 dyn/cm2 resulted in significantly increased mRNA expression of RUNX2 after one hour of PFF in the absence of soluble osteogenic induction factors. This is the first study to describe a method for the fabrication of high surface area gilled fibers and scaffolds. 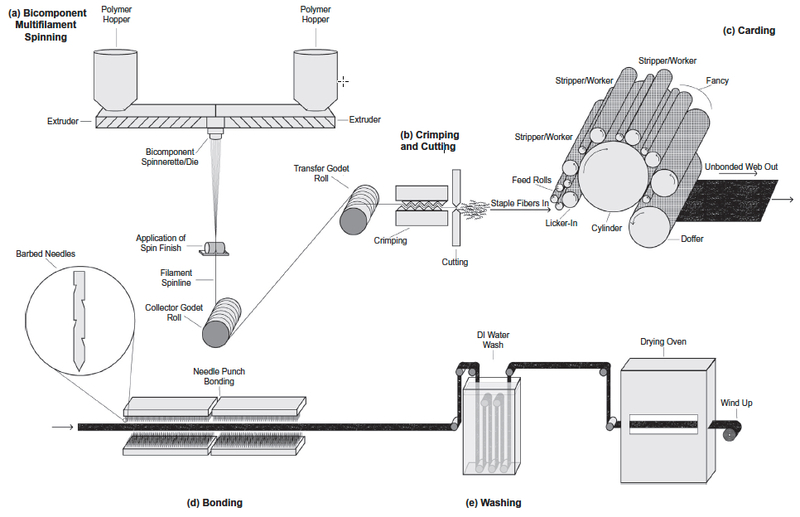 The scalable manufacturing process and potential fabrication across multiple nonwoven and woven platforms makes them promising candidates for a variety of applications that require high surface area fibrous materials. We report here for the first time the successful fabrication of novel high surface area gilled fiber scaffolds for tissue engineering applications. Gilled fibers led to a significant increase in proliferation of human adipose derived stem cells after one week in culture, and a greater number of viable cells compared to round fiber controls. Further, in the absence of osteogenic induction factors, gilled fibers led to significantly increased mRNA expression of an early marker for osteogenesis after exposure to pulsatile fluid flow. This is the first study to describe gilled fiber fabrication and their potential for tissue engineering applications. The repeatable, industrially scalable, and versatile fabrication process makes them promising candidates for a variety of scaffold-based tissue engineering applications. In the last section of this post a recent presentation by the FDA is given as well as an excellent pdf here BioprintingGwinnfinal written by a student at University of Kentucky James Gwinn on regulatory concerns of bioprinting. Bio-printing has been touted as the pinnacle of additive manufacturing and medical science, but what if it might be shut down before it splashes onto the medical scene. Research firm, Gartner Inc believes that the rapid development of bio-printing will spark calls to ban the technology for human and non-human tissue within two years. A report released by Gartner predicts that the time is drawing near when 3D-bioprinted human organs will be readily available, causing widespread debate. They use an example of 3D printed liver tissue by a San Diego-based company named Organovo. Bio-printing uses extruder needles or inkjet-like printers to lay down rows of living cells. Major challenges still face the technology, such as creating vascular structures to support tissue with oxygen and nutrients. Additionally, creating the connective tissue or scaffolding-like structures to support functional tissue is still a barrier that bio-printing will have to overcome. Organovo has worked around a number of issues and they hope to print a fully functioning liver for pharmaceutical industry by the end of this year. “We have achieved thicknesses of greater than 500 microns, and have maintained liver tissue in a fully functional state with native phenotypic behavior for at least 40 days,” said Mike Renard, Organovo’s executive vice president of commercial operations. clinical trails and testing of organs could take over a decade in the U.S. This is because of the strict rules the U.S. Food and Drug Administration (FDA) places on any new technology. Bio-printing research could outplace regulatory agencies ability to keep up. Other companies have been successful with bio-printing as well. Munich-based EnvisionTEC is already selling a printer called a Bioplotter that sells for $188,000 and can print 3D pieces of human tissue. China’s Hangzhou Dianzi University has developed a printer called Regenovo, which printed a small working kidney that lasted four months. “These initiatives are well-intentioned, but raise a number of questions that remain unanswered. What happens when complex enhanced organs involving nonhuman cells are made? Who will control the ability to produce them? Who will ensure the quality of the resulting organs?” Basiliere said. It’s interesting to hear Gartner’s bold predictions for bio-printing. Some of the experts we have talked to seem to think bio-printing is further off than many expect, possibly even 20 or 30 years away for fully functioning organs used in transplants on humans. However, less complicated bio-printing procedures and tissue is only a few years away. Simply put, the FDA is trying to stay current with advanced manufacturing technologies that are revolutionizing patient care and, in some cases, democratizing its availability. When a next-door neighbor can print a medical device in his or her basement, it clearly has many positive and negative implications that need to be considered. Ignoring the regulatory implications for a moment, the presentations at the workshop were fascinating. STERIS representative Dr. Bill Brodbeck cautioned that the complex designs and materials now being created with additive manufacturing make sterilization practices challenging. For example, how will the manufacturer know if the implant is sterile or if the agent has been adequately removed? Also, some materials and designs cannot tolerate acids, heat or pressure, making sterilization more difficult. Dr. Thomas Boland from the University of Texas at El Paso shared his team’s work on 3-D-printed tissues. Using inkjet technology, the researchers are evaluating the variables involved in successfully printing skin. Another bio-printing project being undertaken at Wake Forest by Dr. James Yoo involves constructing bladder-shaped prints using bladder cell biopsies and scaffolding. Dr. Peter Liacouras at Walter Reed discussed his institution’s practice of using 3-D printing to create surgical guides and custom implants. In another biomedical project, work done at Children’s National Hospital by Drs. Axel Krieger and Laura Olivieri involves the physicians using printed cardiac models to “inform clinical decisions,” i.e. evaluate conditions, plan surgeries and reduce operating time. As interesting as the presentations were, the subsequent discussions were arguably more important. In an attempt to identify and address all significant impacts of additive manufacturing on medical device production, the subject was organized into preprinting (input), printing (process) and post-printing (output) considerations. Panelists and other stakeholders shared their concerns and viewpoints on each topic in an attempt to inform and persuade FDA decision-makers. An interesting (but expected) outcome was the relative positions of the various stakeholders. Well-established and large manufacturers proposed validation procedures: material testing, process operating guidelines, quality control, traceability programs, etc. Independent makers argued that this approach would impede, if not eliminate, their ability to provide low-cost prosthetic devices. Comparing practices to the highly regulated food industry, one can understand and accept the need to adopt similar measures for some additively manufactured medical devices. An implant is going into someone’s body, so the manufacturer needs to evaluate and assure the quality of raw materials, processing procedures and finished product. But, as in the food industry, this means the producer needs to know the composition of materials. Suppliers cannot hide behind proprietary formulations. If manufacturers are expected to certify that a device is safe, they need to know what ingredients are in the materials they are using. Many in the industry are also lobbying the FDA to agree that manufacturers should be expected to certify the components and not the additive manufacturing process itself. They argue that what matters is whether the device is safe, not what process was used to make it. Another distinction should be the product’s risk level. Devices should continue to be classified as I, II or III and that classification, not the process used, should determine its level of regulation. Will the FDA Regulate Bioprinting? (3DPrintingChannel) The FDA currently assesses 3D printed medical devices and conventionally made products under the same guidelines, despite the different manufacturing methods involved. To receive device approval, manufacturers must prove that the device is equivalent to a product already on the market for the same use, or the device must undergo the process of attaining pre-market approval. However, the approval process for 3D printed devices could become complicated because the devices are manufactured differently and can be customizable. Two teams at the agency are now trying to determine how approval process should be tweaked to account for the changes. 3D Printing and 3D Bioprinting – Will the FDA Regulate Bioprinting? The 3d printing revolution came to medicine and is making people happy while scaring them at the same time! 3-D printing—the process of making a solid object of any shape from a digital model—has grown increasingly common in recent years, allowing doctors to craft customized devices like hearing aids, dental implants, and surgical instruments. For example, University of Michigan researchers last year used a 3-D laser printer to create an airway splint out of plastic particles. In another case, a patient had 75% of his skull replaced with a 3-D printed implant customized to fit his head. The 3d printing revolution came to medicine and is making people happy while scaring them at the same time! FDA currently treats assesses 3-D printed medical devices and conventionally made products under the same guidelines, despite the different manufacturing methods involved. To receive device approval, manufacturers must prove that the device is equivalent to a product already on the market for the same use, or the device must undergo the process of attaining pre-market approval. “We evaluate all devices, including any that utilize 3-D printing technology, for safety and effectiveness, and appropriate benefit and risk determination, regardless of the manufacturing technologies used,” FDA spokesperson Susan Laine said. With 3D printers, what used to exist only in the realm of science fiction — who doesn’t remember the Star Trek food replicator that could materialize a drink or meal with the mere press of a button — is now becoming more widely available with food on demand, prosthetic devices, tracheal splints, skull implants, and even liver tissue all having recently been printed, used, implanted or consumed. 3D printing, while exciting, also presents a unique hybrid of technology and biology, making it a potentially unique and difficult area to regulate and oversee. With all of the recent technological advances surround 3D printer technology, the FDA recently announced in a blog post that it too was going 3D, using it to “expand our research efforts and expand our capabilities to review innovative medical products.” In addition, the agency will be investigating how 3D printing technology impacts medical devices and manufacturing processes. This will, in turn, raise the additional question of how such technology — one of the goals of which, at least in the medical world, is to create unique and custom printed devices, tissue and other living organs for use in medical procedures — can be properly evaluated, regulated and monitored. It will be interesting to see if the FDA can retool the agency to make it a more flexible, responsive, and function-specific organization. In the short term, the FDA has tasked two laboratories in the Office of Science and Engineering Laboratories with investigating how the new 3D technology can impact the safety and efficacy of devices and materials manufactured using the technology. The Functional Performance and Device Use Laboratory is evaluating “the effect of design changes on the safety and performance of devices when used in different patient populations” while the Laboratory for Solid Mechanics is assessing “how different printing techniques and processes affect the strength and durability of the materials used in medical devices.” Presumably, all of this information will help the FDA evaluate at some point in the future whether a 3D printed heart is safe and effective for use in the patient population. In any case, this type of hybrid technology can present a risk for companies and manufacturers creating and using such devices. It remains to be seen what sort of regulations will be put in place to determine, for example, what types of clinical trials and information will have to be provided before a 3D printer capable of printing a human heart is approved for use by the FDA. Or even on a different scale, what regulatory hurdles (and on-going monitoring, reporting, and studies) will be required before bioprinted cartilage can be implanted in a patient’s knee. Are food replicators and holodecks far behind? The US Food and Drug Administration (FDA) plans to soon hold a meeting to discuss the future of regulating medical products made using 3D printing techniques, it has announced. 3D printing is a manufacturing process which layers printed materials on top of one another, creating three-dimensional parts (as opposed to injection molding or routing materials). The cost of 3D printers has come down considerably. Electronic files which automate the printing process are shareable over the Internet, allowing anyone with the sufficient raw materials to build a part. The technology behind 3D printing is becoming more advanced, allowing for the manufacture of increasingly durable parts. While the technology has some alarming components—the manufacture of untraceable weapons, for example—it’s increasingly being looked at as the future source of medical product innovation, and in particular for medical devices like prosthetics. But while 3D printing holds promise for patients, it poses immense challenges for regulators, who must assess how to—or whether to—regulate the burgeoning sector. In a recent FDA Voice blog posting, FDA regulators noted that 3D-printed medical devices have already been used in FDA-cleared clinical interventions, and that it expects more devices to emerge in the future. Already, FDA’s Office of Science and Engineering laboratories are working to investigate how the technology will affect the future of device manufacturing, and CDRH’s Functional Performance and Device Use Laboratory is developing and adapting computer modeling methods to help determine how small design changes could affect the safety of a device. And at the Laboratory for Solid Mechanics, FDA said it is investigating the materials used in the printing process and how those might affect durability and strength of building materials. And as Focus noted in August 2013, there are myriad regulatory challenges to confront as well. For example: If a 3D printer makes a medical device, will that device be considered adulterated since it was not manufactured under Quality System Regulation-compliant conditions? Would each device be required to be registered with FDA? And would FDA treat shared design files as unauthorized promotion if they failed to make proper note of the device’s benefits and risks? What happens if a device was never cleared or approved by FDA? The difficulties for FDA are seemingly endless. But there have been indications that FDA has been thinking about this issue extensively. Responding to Focus, Shuren said the guidance would be primarily focused on the “manufacturing side,” and probably on how 3D printing occurs and the materials used rather than some of the loftier questions posed above. “What you’re making, and how you’re making it, may have implications for how safe and effective that device is,” he said, explaining how various methods of building materials can lead to various weaknesses or problems. That language—”transparent evaluation process for future submissions”—indicates that at least one level, FDA plans to treat 3D printing no differently than any other medical device, subjecting the products to the same rigorous premarket assessments that many devices now undergo. Among FDA’s chief concerns, it said, are process verification and validation, which are both key parts of the medical device quality manufacturing regulations. But the notice also indicates that existing guidance documents, such as those specific to medical device types, will still be in effect regardless of the 3D printing guidance. If you are interested in submitting comments to the FDA on this topic, post them by Nov. 10.